Puttu is one of the staple breakfast items popular in Kerala. During my mom’s childhood days, puttu used to be the only breakfast served during weekdays. My grandmother used to make idli, dosa, appam etc. only during weekends. When I shared the puttu recipe some days back, I had mentioned about the different varieties of puttu. 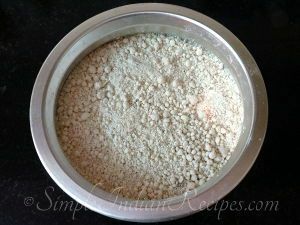 Today I will be sharing the recipe of one of the popular Malabar puttu variety called Erachi Puttu. Here a tasty stuffing is made with any meat. You can use any leftover meat for this provided it is minced or shredded. In-fact, you can use any dry meat preparations where the meat is cut in small pieces. It converts the regular puttu into a tasty rich dish. 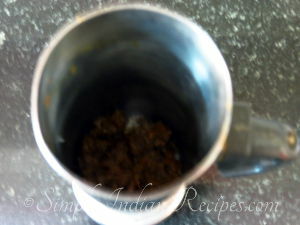 I made this with some leftover beef masala that I had and clicked the pictures but I have shared the recipe to make the meat masala stuffing from scratch with ground meat. Heat oil in a pan and add finely chopped onions. Saute for a couple of minutes. Add ginger garlic paste and fry. Next add the chopped tomatoes. Cook till the tomatoes are soft, and then add the masala powders (dry spices). Add the minced meat (chicken, mutton, turkey or beef)), salt and 2 tbsp of water. Cover and cook for 5-10 minutes. After all the liquid dries up, mix in the finely chopped coriander leaves and switch off. The meat stuffing is ready. 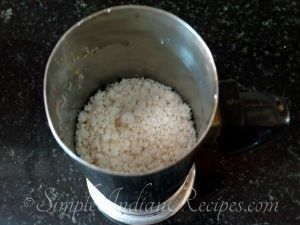 If you have any leftover dry meat preparation, you can use it to make Erachi Puttu. 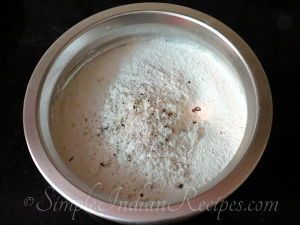 Take the puttu podi in a mixing bowl. 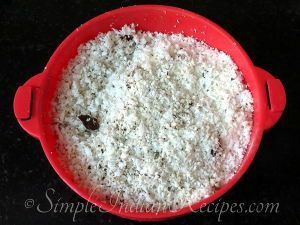 Add salt, 2 tbsp of grated coconut and mix it. Add water little by little and mix well till the flour becomes moist. Break any lumps formed with your fingers. The flour should be crumbly but it should hold together when you press between the palms. The flour is now ready. Also keep some freshly grated coconut ready. 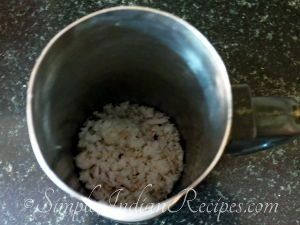 Fill water in the puttu kudam or the pressure cooker and bring it to a boil. Place the perforated disc at the bottom of the puttu kutty and start filling it. First add 1 tbsp of grated coconut followed by 3-4 tbsp of puttu flour followed by 2 tbsp of meat. Be sure not to pack the layers tightly. It needs to be loose enough for the steam to pass through and cook the flour. Repeat this till you reach the top of the puttu kutty. You can make it in the cylindrical puttu kutty or the cherata puttu kutty. 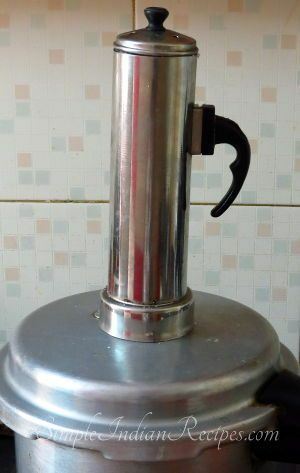 Cover with the lid and place it on the pressure cooker or the puttu kudam. Cook it for 5-7 minutes or till the steam starts coming out as a continuous steam through the holes of the lid. Push the cooked puttu out using the stick that comes with it. In case of cherata putt, you can just invert it on to the plate. The puttu will take the shape of the mould when it is cooked perfectly. 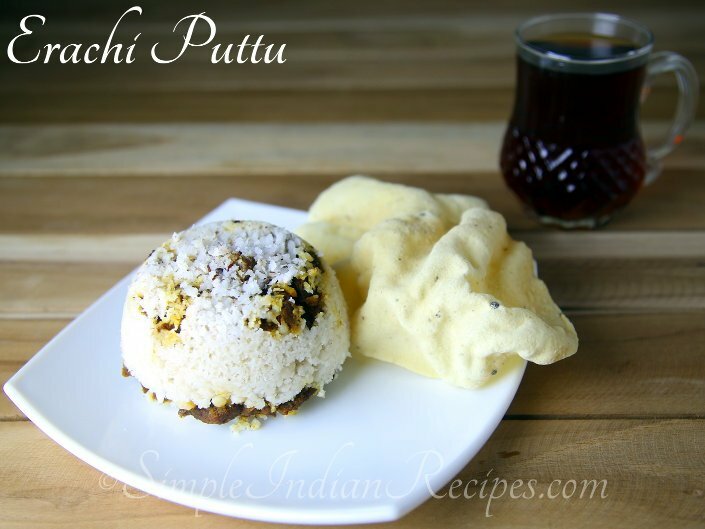 Serve this tasty erachi puttu when it is hot. 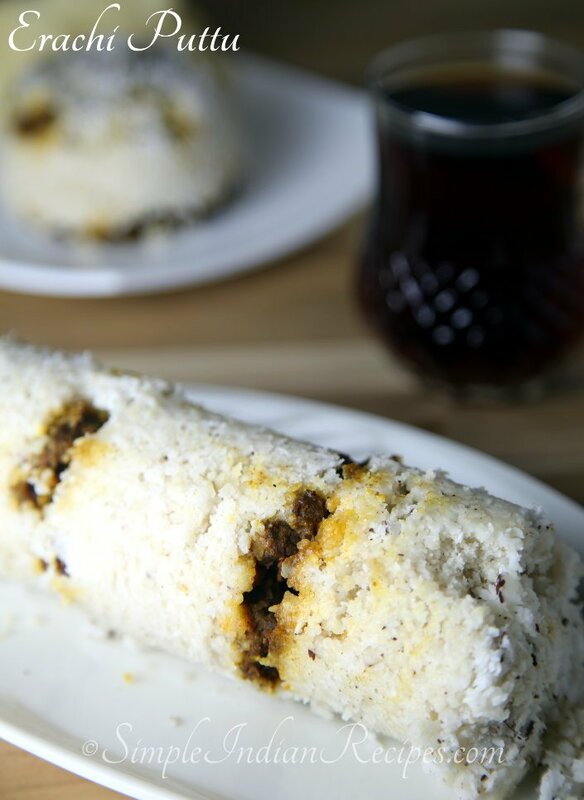 This erachi puttu can be served as it is because it has a tasty masala stuffing. It goes very well with some papadams and some kattan chaaya (black tea).